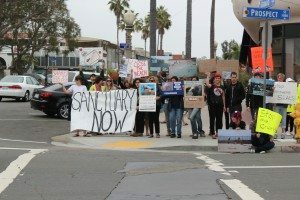 Chanting “shared use is abuse” and “just one beach for the seals,” more than 30 seal sympathizers rallied in La Jolla [Saturday, May 7th] marching down to Children’s Pool carrying signs advocating creation of a marine mammal sanctuary there. The protest comes in response to a growing number of pro-beach access advocates who, in recent weeks, have been exercising their right to access the pool beach by crossing over the guideline rope meant to separate humans and marine mammals. The rope has been up during the seals’ pupping season which began Dec. 15 and will end Sunday, May 15. “Shared use, it’s not working to protect the seals or the natural ecology, so we’re here calling for ending harassment of the seals,” said Tim Rusmisel, a seal sympathizer who autonomously organized the rally by pro-seal groups including Sea Shepherd, the Animal Protection and Rescue League (APRL) and La Jolla Friends of the Seals which operates a docent program at the pool. Shively said shared use has had negative consequences on marine mammals. “What I’ve seen is fewer pups this year and a lot fewer pups and moms interacting during the pupping season,” she said. “If we had a marine mammal park for the protection of seals and the education of people, it would be shared in the way of people being able to observe seals and would also give the seals the very-deserved respite they need,” she said. Martha Platt of San Diego, a volunteer with Save the Seals, said she’s been “startled” by the level of harassment and disrespect for the harbor seals down on the beach. “In an era where we are learning to share with animal species — this is really shocking,” she said. Shively was passing out pro-seal signs and photographs taken by La Jollan James Hudnall, a longtime seal sympatizer, showing people crowding seals on Children’s Pool beach. “It’s a small group of outspoken people who are bullies and who just want power for themselves,” commented Pam Harris who turned out to protest shared use at Casa Beach. One good seal bite will solve this whole pissin contest!! I bet the seals would laugh too if they could, what a joke. The importance of the year-round rope grows as the divers escalate! Older Article: Oceanographers say wind shift could cause sea-level rise. Newer Article: Redrawing County districts? Ho-hum says public.